When two or more generators with same frequency, voltage and phase difference are connected to the bus-bar; such that it increase their overall capacity, ease of maintenance, and active load management. Then they are called to be connected in parallel; and the method used is called paralleling. While the process used in this method to assist is known as synchronizing. It is an effective way to increase the overall power output of a plant; with much better control and ease of maintenance. This helps do the job without spending money on buying high capacity generators. The process is used where the demand for power is variable with extreme points; too low and too high power demand. For two generators to be synchronized; the waveform of their output must match with one another. This can be achieved by using a synchroscope or dark and bright lamp methods. To ensure further safety; it is required to keep the incoming generator at sightly higher frequency. A generator already connected to the bus bar is called running generator; while the one which need to be synchronized to connect is called incoming generator. A generators frequency reduce slightly once it is applied to active load; and thus an increased frequency help it avoid running as a synchronous motor. 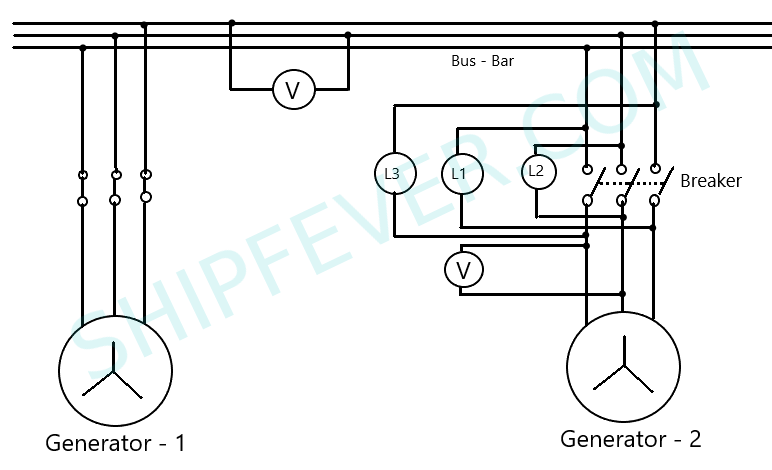 Moreover a generator is not connected to the bus bar under stationary condition as; it will cause high induced emf in stator winding causing it to short circuit. Heavy industries and ship with high power demand are installed with two or more three phase generators; to effectively share the load and provide increased output when needed. 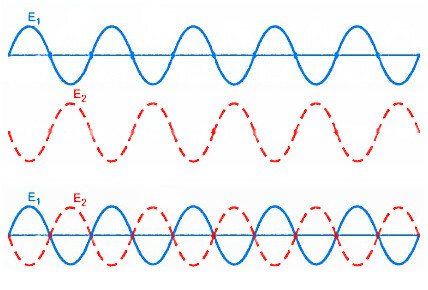 For two generators to be synchronized they must have equal number of phase; same phase angle, same voltage, frequency and identical voltage sine curve ( waveform ). This means the RYB connection point of bus bar; should be connected to RYB terminals of incoming generator and not RBY. 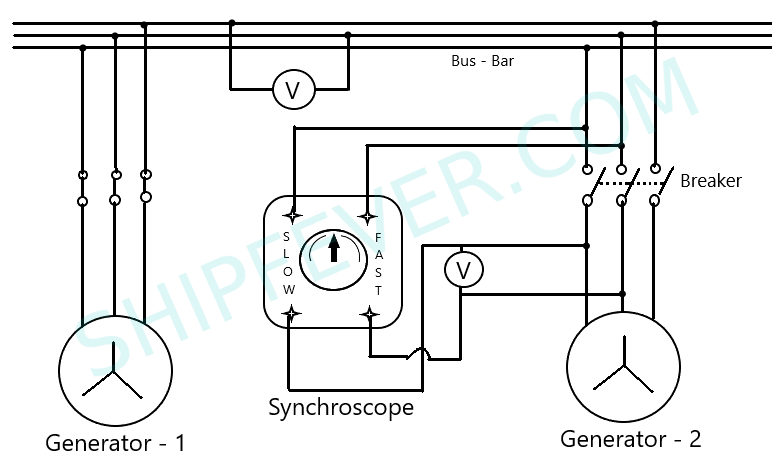 An three phase incoming generator can be synchronized to the one connected to the bus bar; using bright lamp, dark lamp or synchroscope method. For generators to be properly synchronized they must be locked finally to the system frequency; irrespective of their initial speed or frequencies. Once synchronized they must share the total load according to their individual capacity and not equally. For generators to share equal loads they must be identical in most aspects. When two generators are connected in parallel their e.m.f E1 and E2 are in opposite phase; with respect to their internal circuit while in shame phase for external circuit. Under this condition if one generator tries to move out of synchronization; their internal circuit will subjected to synchronizing current. This synchronizing current denoted by Is = Er / Zs reestablish synchronicity between the two alternators. Here; Er is the net resultant voltage of the system while the Zs is the impedance of synchronization. The different method used to achieve this synchronization are given below. While all modern control panel either on ship or large industry have facility to parallel generators automatically; it is necessary to understand and prepare to do it manually in case. A synchroscope is a device used to measure the degree of synchronization; so that we can close the breaker at the right time. It represents the relative speed of the incoming machinery with the help of a pointer. If it moves anti clock wise then the speed of incoming generator is less; while is more if it moves clockwise. Start the incoming generator and warm it up while increasing its speed to the meet the required operational frequency. Monitor in the control panel whether the incoming generator have the same voltage and frequency that of the bus-bar. Make sure both of your generators have the same phase sequence. Make necessary adjustments if required to meet identical voltage, frequency and phase sequence. Now switch on the synchroscope and monitor the movement of pointer. If the pointer moving anticlockwise increase the speed; if it moves fast along clockwise direction reduce the alternator speed. Keep the speed of incoming generator slightly more than that on load; such that the pointer moves very slowly clockwise. Engage the breaker just before the pointer reach midnight ( 12’O Clock ); it is the moment when the incoming generator is in phase with the bus bar. Once done decide whether you need both generators on load or need to shut down the running generator. This can be achieved by lowering the governor switch of running generator while increasing for incoming generator. Switch off or trip the breaker for the running generator; now the generator is on standby. Proper synchronization for an alternator can be achieved by using either; dark lamp or one dark two bright lamp method. It is an cheap alternative for the expensive synchroscope for the job. In dark lamp method all the three bulb is connected across the same phase; i.e RR’, YY’, BB’ with a voltmeter connected across two phase of the bus bar and terminals of incoming generator. On other hand one dark and two bright lamp method have; one lamp connected in phase while others out of phase to the bus-bar i.e RB’, YY’, BR’. The basic idea behind working of dark lamp method is that; when the two generators are in synchronicity their net resultant frequency will be zero. You can consider it by this; if bus-bar frequency is 60 Hz and that of incoming generator is 50 Hz then resultant frequency is 10 Hz. At this point in time all the three lamps will remain dark. Initially when there is a difference between these frequencies the resultant frequency will cause the lamp to flicker ( On and OFF ) concurrently. Just in case if these bulb don’t flicker concurrently its a clear cut indication of incorrect phase sequence; stop the incoming generator and replace the terminal positions. In the process the breaker is closed when during the dark phase of the light when the net frequency is almost 1. Similarly we can use two bright and one dark method to do it more efficiently. Start the Prime mover of the alternator and bring it to its rated speed. Connect the three lamps and a voltmeter to its terminal as shown in the above figure; following two bring and one dark lamp method. Check whether the incoming generator have the same voltage as of the bus-bar. If not; increases the voltage by changing field current in the alternator till it mach up with that of the bus bar. Watch for the bulb flicker and decide whether it follows an anticlockwise or clockwise pattern. An anticlockwise movement indicates slow speed while a clockwise movement indicate; fast speed of the incoming generator in respect to the bus bar or running generator. Change the speed of the alternator accordingly to reduce the flicking of the bulb to nearly zero or as low as possible. Now close the breaker at moment when the bulb connected in phase is dark while the others two are equally bright. Now disconnect the supply to the lamps and turn off the step down transformer connected if any. It is a general practice for high voltage generators to connect these lamps via an step down transformer. A single phase generator can be synchronized and then connected in parallel by using dark lamp or bright lam method of synchronization. Other than the dark lamp and one dark two bright lamp method in three phase generator; here we only use two lamps for the whole process. 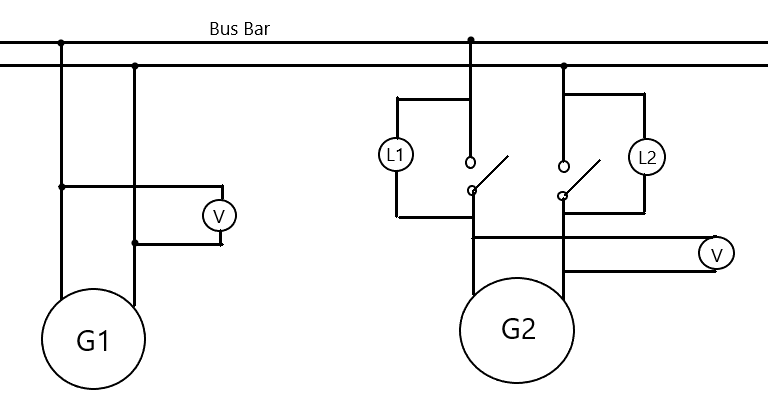 For dark lamp method; the lamps are connected in phase to the terminal and the bus bar as shown in the diagram. While for bright lamp method they are connected out of phase to each other. The light bulb will flicker with alternate dark and bright phase based on the net resultant frequency of generators. Now when the frequency and voltage of the running generator; is matched with that of the incoming generator the bulb will not glow. It is so because the root mean square value; of their voltage for the waveform is in equal but opposite magnitude. This can be represented in general by two equal but opposite waveform; as in below diagram. Similar to that in three phase alternators close the breaker in the middle of the dark phase or period. The two output are in exact phase opposition at that point of time. If not done properly the generator might not synchronize; which lead to reverse power trip or simply called blackout. Pay special attention during the process as in single phase generators; even if the magnitude of output voltage of each generator be same the net resultant voltage may be different. Parallel Operation of Portable Generators – The Easy Way ! No one ever wants to get into complexity of manually synchronizing generators; specially when it comes to portable generators at home or camp ( Picnic ). It’s not just require attention and experience but could also damage the generator if things goes wrong. With all that advancement in technology we want something which; take care of all this important stuff for us and is easy to use. You can check out my personal favorite parallel kit for generators with its price Over Here on Amazon. You just have to plug it in the outputs and then start together to enjoy increased / combined output. But its not the only product out there so pick the one which is compatible with your generator and is cost effective. For most portable generators they have dedicated socket for connecting paralleling cables termed as “Parallel output” or just “Parallel”. Connect the both ends of cable on both of the generator and the internal generator control with inbuilt program for parallel operation will take care of it. Two or more generators are run in parallel on ship, industries and power plants to share load; increase power output, provide ease of maintenance and reduced operational cost. A generator can be run in parallel by providing proper synchronization and effective load sharing. While all generator panels either local or in control room have automatic synchronization facility; it is not uncommon to see a backup manual synchronization method provided for emergency. 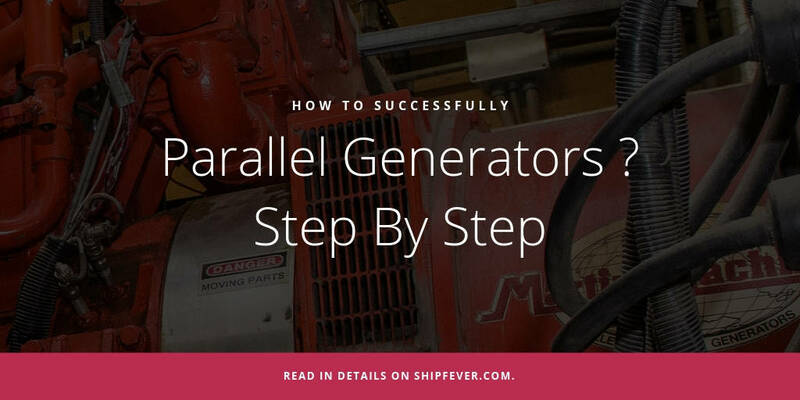 To achieve smooth paralleling of generator they must be first taken up to same frequency; voltage and phase angle to properly synchronize using one of its method. A generator can be synchronized to another generator or the bus bar using; a synchroscope, dark lamp and one dark two bright lamp method.